← Windows weirdness: system clock stopped working. Let’s discuss semantics. Do we take headache medicine to cause headaches or to cure them? Are deer rifles used by deer or for hunting them? The English language doesn’t work quite the same way as German, which is why the literal translation of the term Sturmgewehr (“assault rifle”) should have a very different meaning. 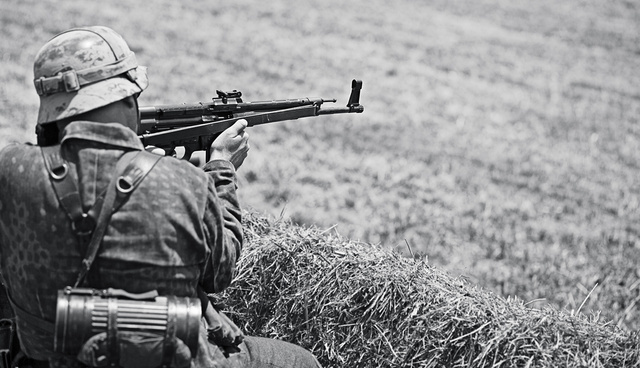 The original Sturmgewehr 44 at the moment of firing. By analogy with all other adjectives modifying nouns, assault rifles would be used to stop assaults. In the context of civilian use, that’s precisely their intended and most frequent role. 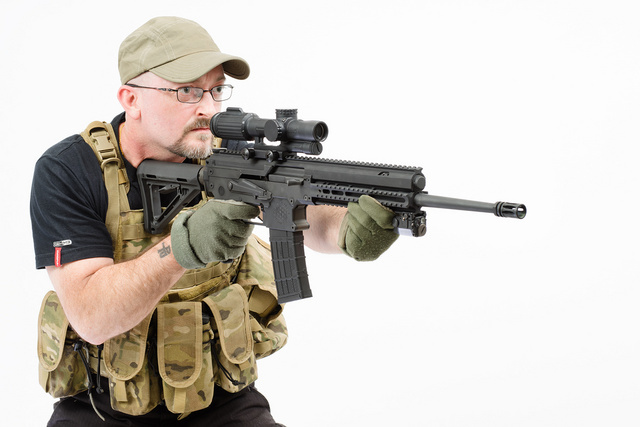 When confronted with violence and given no avenue of escape, a modern rifle is among the best tools to have on hand, along with armor, spare magazines, a side arm and numerous friends with the same. Armored and armed with .223 rifle with 1-6x scope and a light/laser. This combination provides for defense starting at bad breath range and out to at least 300 meters. As the Texas Tower Shooting showed, having long range reach can be vital for countering sniper attacks. Given the tendency of evil to attack without warning, that kind of readiness is seldom possible. If confronted with a sudden assault, as the Charlie Hedbo employees were, most of us would only have the time to unholster a pistol. If at a workplace or near a vehicle, a counter-assault rifle might be on hand and a far better tool for the job. Twice the ammunition capacity, about four times the kinetic energy per shot and much better precision than pistols make long guns the preferred choice for defense from murderous evil. A much more basic kit available at a moment’s notice at the office, provided the employer doesn’t mandate helplessness. And if they insist, a concealed pistol would have to do. The employer can make all kinds of unreasonable demands, from no underwear on the job to coming unarmed — if the demand doesn’t reasonably relate to the job duties, ignoring it is ethical. An office worker would more likely look like this than as a soldier ready for battle. Yet even this minimal kit of a rifle with a single magazine is likely to be sufficient against the typical terrorist or criminal incursions numbering one or two miscreants. It doesn’t matter if the perpetrators want to kill women, Christians or journalists, the correct response is to shoot them in the act of committing the attack. Hence the rifles for countering assaults, same as analgesics — headache medicines — are for countering headaches. To avoid ambiguity, the term defensive rifle is preferred. But feel free to point out to the critics of preparedness that assault rifles are only offensive in the hands of government troops and psychopaths. In the hands of the general population, they are counter-assault rifles and purely defensive in nature. They are just the medicine to cure psychopathic or evil permanently — and expediently enough to save innocent lives. This entry was posted in rifle, rkba, self-defense, weapon and tagged 223, optic, Trijicon. Bookmark the permalink. 10 Responses to Does headache medicine cause headaches? I have always disagreed with the idea that you NEED or even want an AR or AK rifle to protect yourself in most situations as there are far more “downsides” than “upsides” involved in defending yourself with a carbine V. a shotgun or handgun. If you have a carbine and armor in your car you WILL be arrested in almost all of America if a cop sees them. If G_D forbid, you actually use them, 99.999% of cops will automatically see you as the “bad guy” no matter who did what first. There is a 100% chance that an AR or AK bullet will penetrate any wall in any modern house (plywood and plaster with plastic over it) and hit one or more people in the 3 to 4 houses it will penetrate . Shotguns and most handguns drop that likelihood to near zero. Another thing I take issue with is the idea that “Hi-Cap mags” somehow translate into grater safety or ability. Your average SD civilian shooting happens at one to four feet , at night and is over in 5 or less shots. I know that the “gun rights” guys and “preppers” all say “we all NEED a tricked out AR-15 with a “C” mag , NIJ IV body armor and a tricked out Glock and 600 magged rounds , where You can grab ’em at 3 am when the golden zombie hoard crashes the front door” but. it. just. ain’t. true. If most of us ever encounter trouble it will be one to three junkies and it will be over LONG before you can get that AK loaded and on target. Unless you really do sleep with it. AR’s and AK’s are great for what they do well. Infantry ground combat , but they are WAY the wrong tool for a bedroom or “car” gun. Handguns are obviously more expedient, but a rifle is as easy to grab as a shotgun at home. Not everyone lives in apartments, so over-penetration isn’t always a concern…besides, spitzer rifle bullets will destabilize after passing through even thin walls and not go all that far. And I did point out that it’s harder to get geared up in a hurry, which is why a 20 to 40 round magazine would be a good thing to have. Well I speak about “penetration” from bitter experience. About two years ago our local drunk “dropped” his SKS (type 56) and had an “AD” . The bullet went thru his house end to end crossed 300 yards of open ground , keyholed side to side MY roof , then punched side to side the house across the street. So YES THEY WILL. and like most drunks he was broke and we ate the cost of a new roof. And my point about Hi Cap mags + semi autos + body armor, is that in most states the cops will see you as a mass shooter until proved otherwise. Its not right , but With the insanity running amok now a days, I understand the fear. Good old .223 55-gr bullets penetrate far less building material than common pistol bullets. 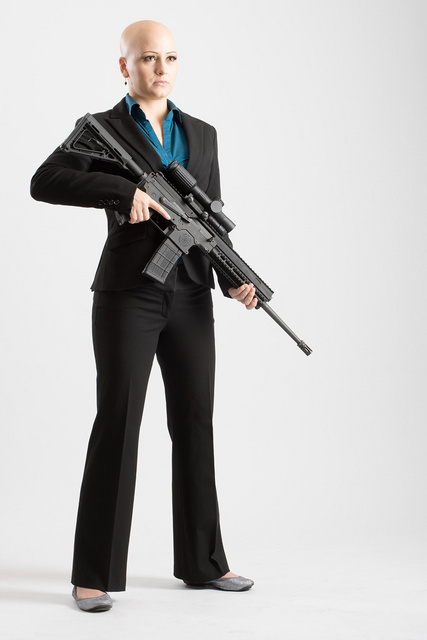 The AR is MUCH safer for people in adjacent rooms than is a pistol. BTW, that’s a “Beta” magazine, not a “C” magazine, please research more carefully. Have you shot an AR-15 or AKM pattern rifle before? You should try one, can be very fun to shoot. Have a nice day sir. So you are a troll . So what? I’m still entitled to MY OPPINION. Just like Oleg, and just like you. I just know when my opinion stops and being a troll starts. Less than you wanted? Far Out! Sorry about that. Weapons fired in my 50+ years shooting? AR15 , M16A1 and A2, M14 ,M21 , M60, M 60 D ,M 79, M 203, M 1919, M-2 .50 CAL. M 1 Garand, M1 Carbine M1903, M1903a3 , XM 177e2, M1911, M1911a1 every basic shotgun type . My Palma rifle. M 1903A4, M1942 , M40 A2 and A3, Mossburg 144. MANY different .22’s . More handguns than I can count or remember . Every black powder type in human history(my family makes them) including cannon. If somebody made one I have shot them. AK’s, SKS, PK’s, PKM’s , RPK’s PPS , PPSH , TT33 1891 M.N. and pretty much everything else ever made in Europe , Asia or the Americas over the last 300 years or so. And MY OPPINION? Guns are for killing and nothing else . I never saw the fun in that. It’s something that must be done at times, but I never learned to enjoy it. I guess shooting was fun when I was young, but now ..not so much. P.S. At one time My Pops, and his brothers and my moms family owned over 7000 firearms (the term “obsessive collector” comes to mind . You should see my mom’s museum -er- house) but sadly most everything has gone to estate sales as the elders have passed. Or as in my case almost all of my collection was sold off to pay my cancer bills. my observation of wall penetration was a 7.62x 51, offshore made, with a steel jacket. It didn’t appear to have a steel core, although I only cut a bullet across at the case mouth, so it’s possible there was one in the rear half. The bullet missed me by about a foot, punched through an interior wall, and exited that in two pieces. The two pieces passed through the control panel of a clothes dryer, through an exterior wall, glanced off a near parallel wall leaving lead smears, and impacted a wood fence slat head on. The pieces left dents in the surface, and were found sitting on the ground directly below. Total distance traveled was maybe 35ft. A story of 9mm wall penetration was sobering. The owner fumbled a Glock, and instead of letting it hit the carpeted floor, he made a grab for it. This caused an ND, the bullet passing through several walls of his house, and then passing through a couple of his neighbors houses. (I think I read his account of this on AR15.com) Much legal trouble followed. There have been some actual testing of wall penetration by a number of entities, which is one of the reasons SWAT teams are migrating to the 5.56/223 caliber, after seeing the results of handgun calibers vs carbines, especially the 9mm. The 9mm seems to have the highest penetration capability of the typical handgun and rifle calibers that are intended for defensive use. Buckshot seems to fall into the handgun range for penetration, IIRC. The round that damaged your roof would appear to be one of those unusual results, and probably not considered to fall into the typical category. It would anchor the far end of the bell curve on penetration performance for caliber, I suspect. Not what you want to encounter, if you are downrange! http://www.theboxotruth.com is one of the testers of ammo performance, especially for penetration results. Sorry to hear about your cancer. Live long enough, and it hits you, or someone close, it seems. Is a patrol rifle used to shoot people who are on patrol? Is an automatic transmission a transmission used only on automatic things? Is an Everything Bagel one that has no limits in its practical application? No; there’s a perfectly good pattern in English for Adjective Noun where Adjective describes not the intended end use of the noun, but the variety of noun. I absolutely agree about the civilian utility of the modern rifle … but the linguistic argument here goes way past a stretch into absurdity.